Although steelhead trout still live today in southern California streams, they are listed as a federally endangered Distinct Population Segment (DPS) (Federal Register 70:67130 ) and are no longer present throughout much of their historic range. 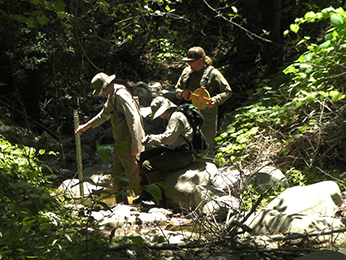 Occupancy surveys for anadromous steelhead trout in the counties of San Diego, Orange and Riverside have resulted in very low number of detections of the species since 2001. Recent research by Jacobson et al. (2014) into the genetics of rainbow trout populations throughout southern California revealed a small population of wild trout in Coldwater Creek (Riverside County) to be the direct descendants of wild steelhead trout (Figures 1 and 2). The Jacobson et al. (2014) study found only one other population of native rainbow trout in San Diego, Orange, and Riverside counties. Therefore, the need to protect, manage and plan for the future habitat management of these fish is urgent. Coldwater Creek is located in Riverside County, originates within the Cleveland National Forest, and outlets within private property, part of which is owned and maintained by the Riverside-Corona Resource Conservation District (District). District staff has been aware of the resident rainbow trout population for many years and have been monitoring Coldwater Creek on a regular basis. 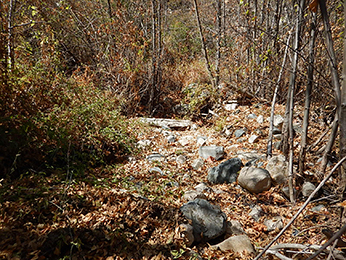 Coldwater Creek has been greatly affected by California’s current drought. While Coldwater Creek is generally characterized as a perennial stream with consistent, year-round flows, portions of the creek dried rapidly in the summer and autumn of 2014. District staff described the summer of 2014 as the first season that sections of the creek have been observed to go dry (Figure 3). Drought monitoring was initiated in June 2014 by District staff and continues on a bi-weekly basis. Monitoring efforts focused on capturing the water temperature, dissolved oxygen, and pH of selected pools. Concurrently, CDFW and District staff characterized available creek habitat utilizing the protocol of the California Salmonid Stream Habitat Restoration Manual, Fourth Edition (Flosi et al., 2010). Available habitat was characterized in the most severe drought conditions of 2014 to determine if the remaining available habitat would provide sufficient refuge for this population (Figure 4). From June 18 to August 14, 2014, CDFW and District staff characterized 3 kilometers (just under two miles) of available habitat. Pools and runs were the most dominant habitat features in the creek. While portions of the creek ran intermittently dry, deep pools remained throughout the creek. Furthermore, multiple size classes of trout were found throughout the creek, including within the highest elevation pool containing water. Throughout the summer and autumn, District staff took water quality measurements at approximately two-week intervals (Figure 5). While water temperatures reached up to 70 degrees Fahrenheit in the large refuge pools, dissolved oxygen and pH remained within normal levels. Lower portions of the creek dried out faster than upper portions of the creek, so a number of individual trout were removed from isolated and drying pools and transferred to larger, cooler pools higher in the creek. 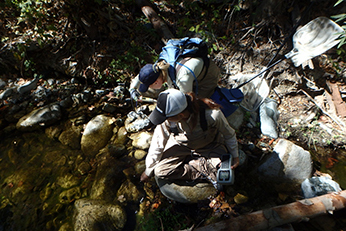 On December 10, 2014, CDFW and District staff installed two temperature loggers within the lower and upper portions of available trout habitat to measure long-term fluctuations in water temperature throughout the creek. Data loggers are anticipated to remain deployed for several years and multiple seasons to provide a more detailed account of daily and seasonal temperature patterns. Figure 5. District and CDFW staff monitor water quality of Coldwater Creek. Monitoring of the Coldwater Creek trout population will continue on a quarterly basis, with more frequent monitoring to be implemented if stream flows decrease again in the spring and summer. The two data loggers will remain in the creek for the foreseeable future to measure temperature fluctuations in two large pools. Long-term management plans will be produced and implemented for this trout population, including a standard rescue protocol in the event of an emergency or severe stressor conditions. Depending on grant funding, large obstructions in the creek are scheduled to be removed to provide a larger range of continuous stream habitat. Flosi, G., S. Downie, J. Hopelain, M. Bird, R. Coey, and B. Collins. 2010. California Salmonid Stream Habitat Restoration Manual, Fourth Edition. California Department of Fish and Game Wildlife and Fisheries Division. Jacobson, S., J. Marshall, D. Dalrymple, F. Kawasaki, D. Pearse, A. Abadia-Cardoso, and J. C. Garza. 2014. Genetic analysis of trout (Oncorhynchus mykiss) in southern California coastal rivers and streams. Final Report for California Department of Fish and Wildlife, Fisheries Restoration Grant Program; Project No. 0950015. Figure 2. Map of Coldwater Creek.